Susquehanna Heritage offers a variety of guides, books, and prints relating to the Susquehanna River and the surrounding region. You can shop for these items on-line or stop in to visit us at the Zimmerman Center for Heritage or Columbia Crossing River Trails Center. The Lower Section of Pennsylvania’s Susquehanna River Water Trail is shown on a series of three maps that guide paddlers down the Susquehanna River. These water resistant folding maps come in a protective vinyl sleeve and are full of information about the sights along the river corridor. The maps start just south of Harrisburg and show points to the Mason-Dixon line. 80 page soft-covered exhibition catalog for the original Visions of the Susquehanna containing reproductions of all exhibit works in full color. The book features essays by David J. Dearinger, Susan Morse Hiles (Curator of Paintings and Sculpture – Boston Anthenaeum), and Leo G. Mazow (Curator of American Art – Palmer Museum of Art, the Pennsylvania State University). The original exhibit, curated by Wrightsville Artist Rob Evans, showed at 6 venues in 3 states (2006-2008). Selected contemporary paintings are now permanent pieces of the Visions of the Susquehanna River Art Collection including works by: Rob Evans, Mark Innerst, Debra Bermingham, Peter Paone, Mark Workman, Michael Allen, Paul Caranicas, Thomas Paquette, Jeffery Reed & Raoul Middleman. Sales support the River Art Fund. Set of 10 maps printed on water-proof paper, enclosed in a re-sealable plastic bag. Contains GPS data. 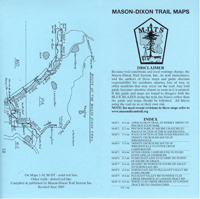 Each map is 20” by 8.5” and folds to 4” by 8.5” format and contains a detailed trail description, and GPS date. Trail extends from Whisky Springs (on the Appalachian Trail) to Chadds Ford for a total of 193 miles. 91-page spiral bound account of John Smith’s travels in the Chesapeake region. Print from pen & ink drawing by Marietta, PA artist David Haneman. Signed by artist, doubled matted and ready to put in frame. Overall size 11 X 14 inches.